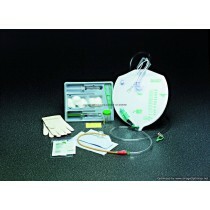 Closed System Catheters are intermittent catheters that are integrated with a urine collection bag. 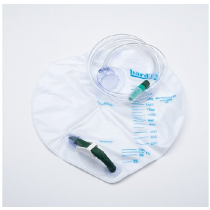 The catheter comes connected to tubing which is connected to a urinary bag. 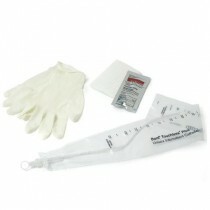 The patient pulls off the cap, inserts the catheter tip into the urethra, pulling out as much of the catheter tubing from the bag as required to reach the bladder. The bladder drains urine directly into the bag. 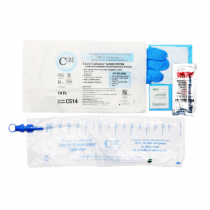 Many self-catheterization kits come with an inducer tip which aids in bypassing the greatest amount of bacteria concentrated in the first few millimeters of the urethra. 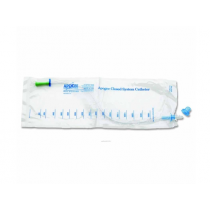 Select between a single self-cath that includes only the catheter-in-a-bag or an entire closed system kit or a catheter tray that includes swabs, sterile pad, drape, catheter, and drainage bag. 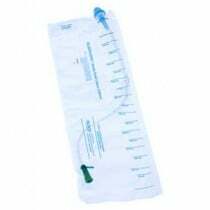 Closed Urinary Catheter Systems reduce the risk of UTI infections. Although this urinary product is used by all types of urinary patients, they are particularly useful to wheelchair patients, pediatric patients and those who have a loss of dexterity. They are designed for public restroom use or home use. 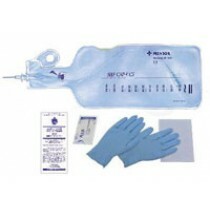 Common elements of self-catheterization kits are listed below. 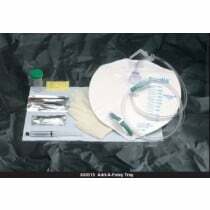 Many features are also common between the different brands of self-catheterization kits. 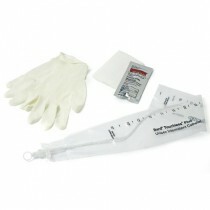 These features include a catheter cap that protects the catheter tip until ready for use. The cap easily pulls off and is discarded. 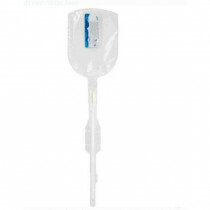 Many closed catheters come with an inducer tip that allows the catheter to by-pass the first set of millimeters of the urethra. This feature helps to protect against UTI infections. 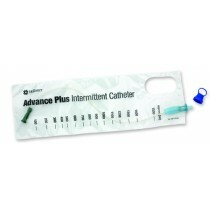 Pre-lubricated catheter reduces a messy insertion, reduces prep time and allows for a smooth touch-free insertion. 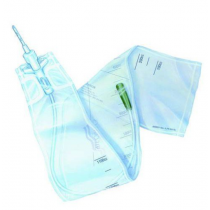 An attached urine collection bag stores urine and has measurement lines to determine output. 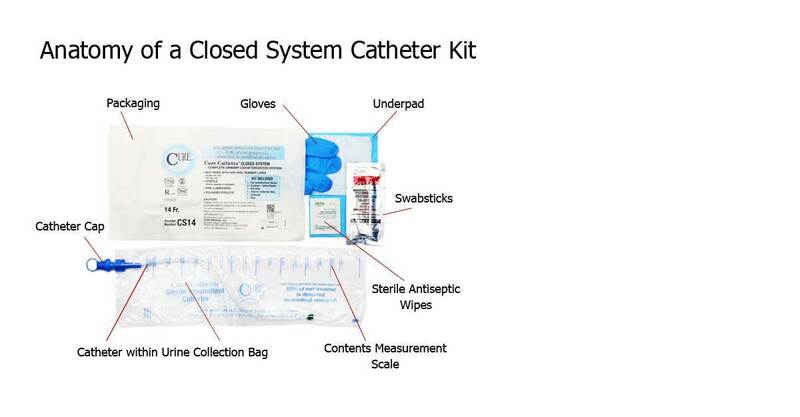 Closed System Kits may come with additional supplies, including swab sticks, gloves, an underpad, antiseptic wipes and gauze pads. Antiseptic wipes are usually impregnated with BZK or povidone-iodine to kill pathogens. Lower risk of UTI infection. 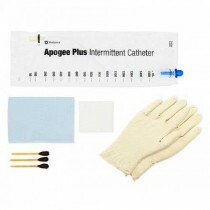 Offers private and discreet catheterization. Bypasses the highest concentration of bacteria in the first few millimeters of the urethra. 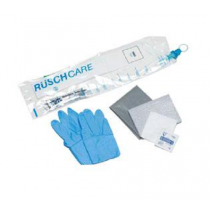 TOUCHLESS® is a registered trademark of Bard Medical for their Self Catheterization Male Kits. 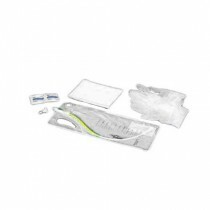 However, Teleflex and Rochester also make catheters that may be inserted without requiring them to be touched in order to insert them. Touch-free catheters reduce the risk of infections. 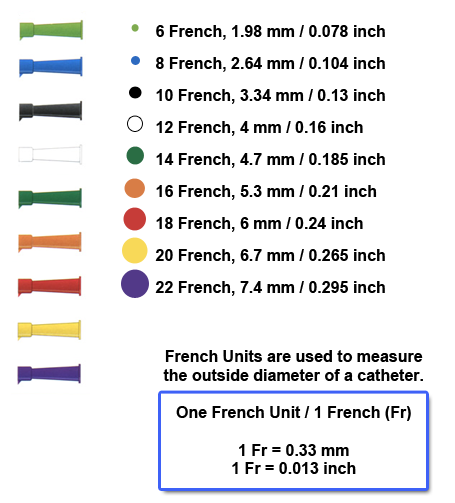 The diameter of the catheter is measured in French sizes, usually ranging from 8 to 18. These sizes have color codes associated with them for quick determination. Length sizes range from 6 inches for women to 16 inches for men. 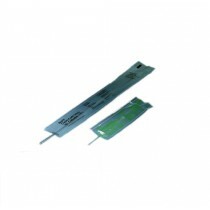 Some extra-long sizes are also available up to 24 inches. Kunin, C. M., & McCormack, R. C. (1966). Prevention of catheter-induced urinary-tract infections by sterile closed drainage. New England Journal of Medicine, 274 (21), 1155-1161. Gould, C. V., Umscheid, C. A., Agarwal, R. K., Kuntz, G., Pegues, D. A., & Healthcare Infection Control Practices Advisory Committee. (2010). Guideline for prevention of catheter-associated urinary tract infections 2009. Infection Control Hospital Epidemiology, 31 (4), 319-326. Warren, J. W. (2001). Catheter-associated urinary tract infections. International journal of antimicrobial agents, 17 (4), 299-303. Sedor, J., Mulholland, S. G. (1999). Hospital-acquired urinary tract infections associated with the indwelling catheter. Urologic Clinics of North America, 26 (4), 821-828. Stamm, W. E. (1975). Guidelines for prevention of catheter-associated urinary tract infections. Annals of Internal Medicine, 82 (3), 386-390.